We live in an era where it is easy to make “friends”. You can have a “friend” on social media, but your connection is simply limited to liking and commenting on each other’s posts. But a real, solid friendship requires time, consistency, and support. YES, this sometimes means that your friend will knock some sense into you with a “tough love” wakeup call. Friendships aren’t always sunshine and daisies, but they are there for you through thick and thin! 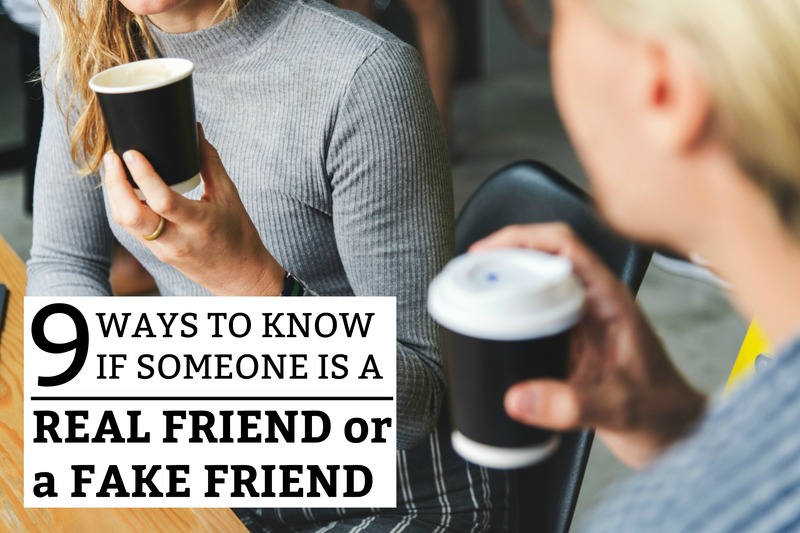 Below are 9 ways to know if someone is a real friend or a fake friend. It sounds simple, but it is SO COMMON! Have you ever forgotten to text someone back for a few days…only to be greeted with the silent treatment or a haughty attitude? This means they’re sensitive and they feel like they should be your first priority – all the time. Talk about a high maintenance friendship! Real friends just “get it”. They realize that you both have busy lives and not texting back isn’t a sign of neglect! Nothing is wrong. No one got offended. Neither of you is upset! LIFE IS BUSY! Actually, this is a good topic to address early on in the friendship. Let them know if it is common for you not to message back right away. It can be a good way to put their worries to rest, so you can focus on building a mutual friendship. If they continue to get offended, perhaps they aren’t the type of friend you want to keep close. 2.) They Always tell you the truth – even when it’s hard! A real friend is someone who tells you the truth, whether you like it or not. They tell you when you are being stupid, selfish, or stubborn. They don’t sugar-coat the truth if they know it is important for you to hear! On the other hand, they don’t only give you advice that benefits themselves. It’s pretty easy to sense when someone is out for their own best interest! Appreciate and invest in your friend(s) who want what is best for you and are willing to tell you – whether it is good or bad. Real friends aren’t jealous of each other. They want to see their friend soar high and become as successful as they can be in their personal and professional life! Jealousy has no place in a real friendship. It always turns into a toxic bitterness that spills over into every aspect of your relationship. You can’t see each other’s face without resenting the fact that one of you is “better off” than the other. If your friend can’t be happy for your happiness (and vice versa), then your friendship isn’t mean to last. OR, you need to have a REAL conversation and address the jealousy. If you can make it out of that still friends, then maybe you have a chance! Real friends tell each other their deepest feelings and share their past hurts. Vulnerability always plays a major role in genuine, close friendships. You know that your friend can know everything about you and not judge or humiliate you. As a result, they keep this PRIVATE between the two of you. They don’t their other friends or family members. You know that your private information is safe with them because they are trustworthy. If you ever find out that they have been telling other people confidential information about you, they are not your friend. In fact, they are probably jealous or bitter about something and don’t mind humiliating or crushing you – just to make themselves look better. No, this is NOT talking about venting about a bad day or leaning on each other for support during the hard times. This is a normal and healthy part of a close friendship. I’m talking about someone who fills your life with the latest gossip, negativity, snide remarks, fear, and tales of gloom and doom! This makes them a toxic and negative person. Can you think back to a time when you felt uplifted and positive after spending time with them? If toxic negativity characterizes your “friend”, they probably aren’t a good or healthy influence in your life. A good friend keeps their promises! When they say they’re going to do something, they follow through. If they are unable to do something, they let you know ASAP, so you aren’t left feeling like you were just let down AGAIN. Is your friend always trying to explain themselves out of a situation that they promised to follow through on. Do you always have this feeling that they are never dependable, honest, or trustworthy? If you want your friendship to work, talk to them about this unhealthy habit of never being reliable. Otherwise, they are probably not a real friend who you want in your life long-term. In this situation, communication is key! They shouldn’t make promises they don’t intend to keep. It shows lack of character. We live in a time where taking care of YOURSELF is heavily encouraged. Although it is important to take care of yourself, this leads many people to believe that they are the priority in every situation. You’re here to make me feel better about MYSELF. Your job in the relationship is to sit here and listen to ME! I’m so glad that I have a friend like you who is always here for ME. Do you sense that your “friendship” revolves around what your “friend” wants? Every time they contact you, is it always in their own self interest? Is it ever about YOU? Do you even really matter to them? Make sure that your friendship is a two-way street. Otherwise, you’ll get locked into a relationship with someone who doesn’t give two-hoots about you – unless you are serving them in some way. No doubts in your mind – they will always be there for you. Maybe you’re a cynical person or someone who finds it hard to trust. If you have been in a friendship long enough, all those doubts should be gone! If you need help moving, your friend is there. If you need some life advice, they are there to give it. When you need to cry, you know who to call! You shouldn’t have to hesitate when you think about whether you can count on them 100%. You just know that they’ll always have your back. …and if you don’t talk for a while, you pick right up where you left off. You could talk for HOURS every time that you are together. People call you “two peas in a pod”. Although it’s not a necessity, common interests and similar life stages help a lot with long-term friendships! When something funny happens in your day, do you just want to text them? When something devastating happens to you, do you think about what they would do if they knew. It shouldn’t be hard to pick up the phone and give them a call. …because they are your friend, and will be for the rest of your life!